I don’t drink alcohol, so sometimes I can be pretty clueless when it comes to the world of wines and cocktails. This summer during our trip to Cancun I fell head-over-heels-in-love with virgin mojitos. 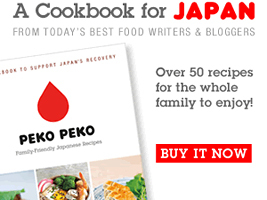 Ever since our trip I’ve been thinking that I needed to find a recipe so I could make them at home. Then last month I received the extra incentive that I needed to finally get my act together and make mojitos at home. My lovely ZESPRI Kiwifruit friends, Cynthia and Lorraine, that were at Camp Blogaway stayed at the Mondrian Hotel in Los Angeles while in town for the event. The Monday after Camp Blogaway was blistering hot (113 degrees Fahrenheit!) and so Karen and Cynthia hit the bar to try and grab a drink to help them cool off. The hotel was short staffed due to the weather and so the bartender was working extra hard, but took the time to make them a special cocktail with some ZESPRI kiwifruit that they gave him—a muddled kiwi mojito. When Lorraine told me about it I begged her to try and get the recipe, so she contacted the Mondrian via Facebook (because she’s awesome) asking for the recipe, and they kindly provided it (because they’re awesome too). I’ve since modified the recipe to come up with a virgin version, and let me tell you, it is so good. You may be wondering why I’m posting a mojito recipe smack-dab in the middle of Fall. First of all, I could drink this any time of year, but secondly, I’m posting it now to tell you to get your act in gear and go out and buy some kiwi. Green kiwi season goes from May through November, so we only have a little over a month longer to enjoy one of my favorite treats until they are in season again next year! In coming up with this adaptation, I learned a few things. One of them was “muddling.” I learned that muddling is bruising fruit or mint with sugar at the bottom of a cocktail shaker or glass. 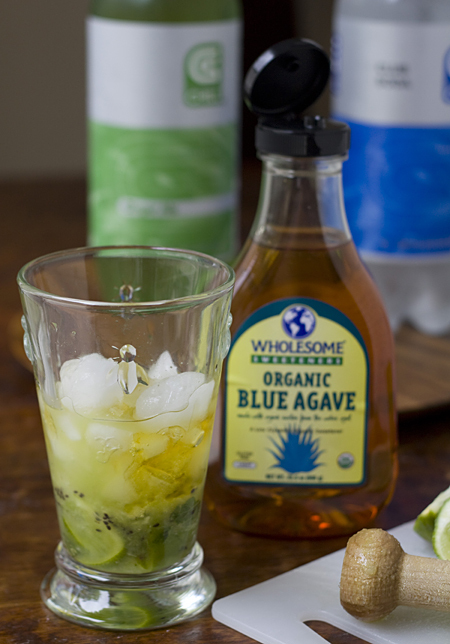 This bruising releases juice and essential oils, which heightens the flavor of the drink. 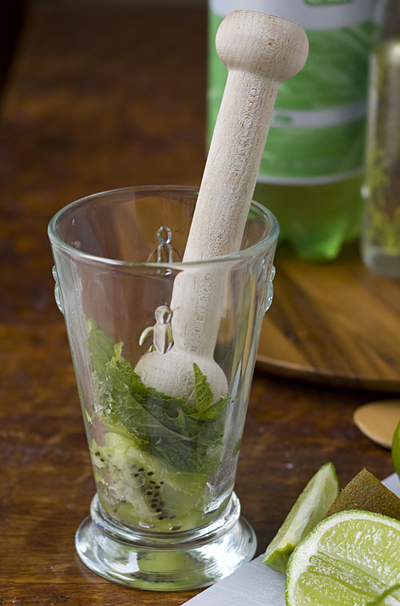 Muddling is done with a muddler, a pestle-like object traditionally made of wood. I had to laugh when I read this, because Mr. Fuji and I saw a basket of wooden coffee stirrers labeled as “Woody Muddlers” when we lived in Tokyo. I always wondered how they had chosen that translation, and now I think I have a pretty good guess! I don’t own a true muddler, but I do own a Tart Tamper which I decided would be a perfect substitute. 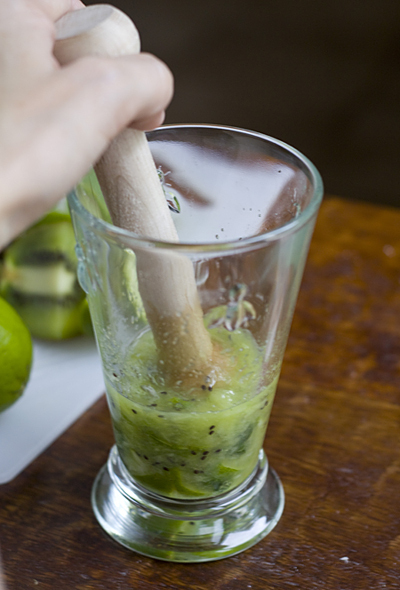 I crushed, ahem, I mean, muddled some fresh green kiwi, lime wedges, and mint leaves in the bottom of a tall glass. then filled the rest of the glass with club soda and a splash of ginger ale, then mixed everything with a spoon. 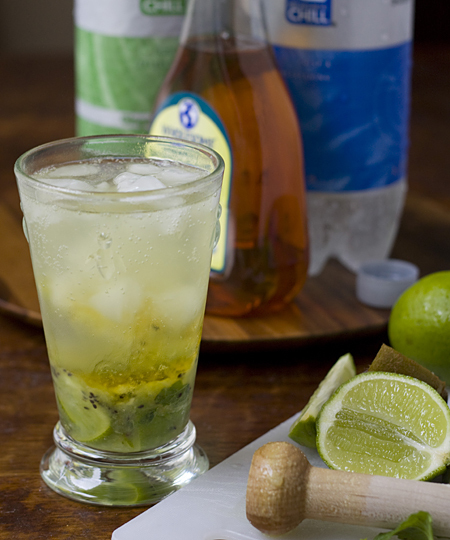 Now that you see how easy this “faux-jito” is to make, you have no excuses. Go make one! 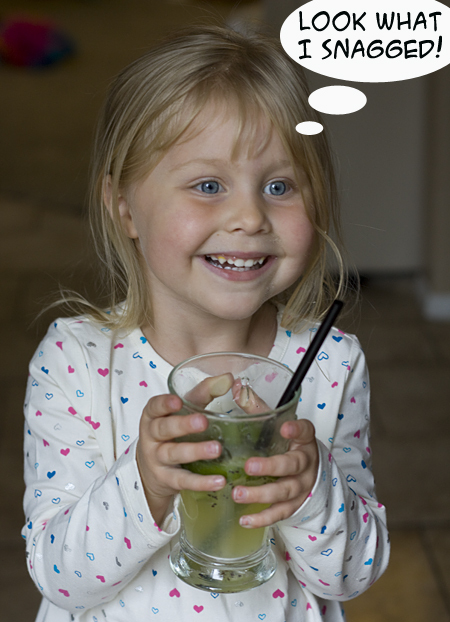 But I’m warning you, you may want to wait until the kids are bed, because I now know from experience that they love virgin muddled kiwi mojitos too, and will steal yours in a heartbeat, leaving you empty-handed. Just sayin’. 3. 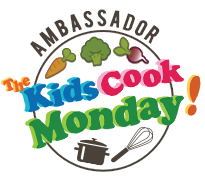 Add the agave nectar and a splash of ginger ale and stir. Then fill the rest of the glass with club soda and stir again. 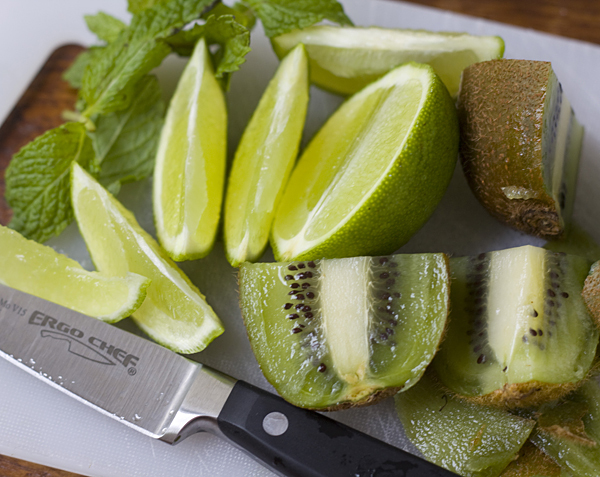 Garnish with a slice of kiwi and some whole mint leaves. Thank you so much for solving something that has had me puzzled for many years- why cocktail swizzle sticks (is that even what they are called in English? I have no idea) are called madoraa (マドラー) in Japanese. Look it up and it just says “muddler” – clear as mud (ahem). This drink looks great. We’re coming into Kiwi season in our part of the world, so I’ll have to give it a try when and if it ever gets warm enough. This looks so yummy (even without the alcohol)!! I’m gonna have to try this soon! sometimes the best part about alcohol is just the fact that it’s a treat…which this DEFINITELY is! Beautiful drink and I appreciate the fact that it is virgin. I’m a non-drinker and am always looking for fun drinks like this. That is a long name for this drink, but it says it all! A couple years ago my sister wanted a muddler, so my daughter and I searched high and low for one, not to be found. Then we happened to stop in this liquor store to see if they had one. Well as it happened they had some plastic ones that was sold with a certain rum bottle. Then we found one on it’s own in a gadget box with wine stoppers, and drink strainers and such, but with no price…when asked how much, he just let us have it! I find it always helps having a cute little girl with you! hehe! I ended up using my tart tamper too when I was making my mint juleps, last may. Hi there. I gave you a little mention on my latest post. http://www.bunkycooks.com/2010/10/blogging-awards-saturday/ Have a fun and spooky Halloween! What a fun twist on a mojito. I’ll bet the kiwi adds a really fresh, unusual flavor. As usual, Squirrel is so darned cute, holding tightly onto her prize. Yummy! Good for a lightweight like me! Mojitos? Favorite Drink. Me? Pregnant. This is the answer to my pregnant prayers! Thank you! This looks delicious!! 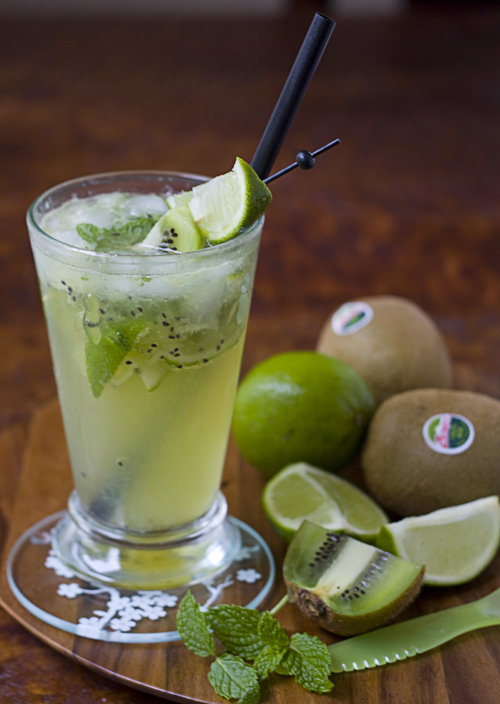 I love the idea of adding kiwi to my favorite beverage! I love mojitos but had never thought of using kiwi. What a great variation. 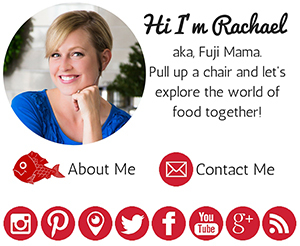 Previous post: Food Ninjas REVEALED! Come and vote! !